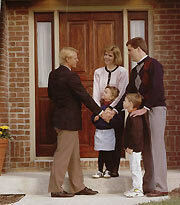 Since 1891 we have consistently found that to be a better mover, we must care about the people we move. At Metro Movers, Inc. we treat you the way we would like to be treated, and move your treasures as if they were our own. The Metro Movers way means customized services based on your needs, including: Careful packing,proper inventory procedures, the right crew and materials, and handling any special challenges you may have. We are well prepared to ensure that there are no surprises. Metro Movers, Inc. has the latest up to date software in the moving Industry. Contact us by using our online quote form or by telephone, if you prefer. Our Sales Team: By calling Metro Movers, Inc. you can set up an appointment with our sales team, a Representative will come to your home to provide you with a customized estimate. Once all of your questions have been answered Call a move specialist to schedule your move with dates we will send you an Order for service to sign. Our crew will arrive between 8:00 AM and 10:00 A.M unless other arrangements have been made. The crew assigned to your move are experienced moving professionals trained in packing & loading techniques. Your goods will be handled with care at all times during the move. The moving crew will arrive at the destination on time, Your goods will be unloaded and placed in the rooms that you want them in. Payment for your move can be made using a cashier's check, money order, or credit card. Credit cards must be approved in advance.